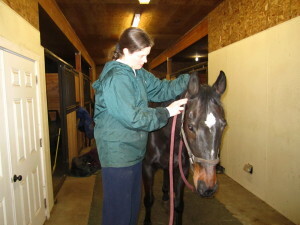 Gentle chiropractic is a drug-free way of curing back issues for horses. Horses were not meant to be ridden so we have a special obligation to keep their backs healthy. The technique is very subtle as you can see in the video below and there is rarely any popping sounds. By slightly moving vertebrae and associated soft tissues, the nerve compression can be alleviated and inflammation reduced almost immediately. I was trained in the 1990’s by Sharon Willougby‘s veterinary chiropractic school and then later by Sherry Gaber in the NUCCA approach. Charlie is a twenty one year-old thoroughbred with an old history of racetrack injury but he is going strong and people often comment on his endurance and good health. Many years ago, I decided to reduce my demands on his performance and spared his delicate feet and legs the jumping career he would have gladly offered. Now I teach occasional lessons on him and take him trail riding. Here are two photos of Charlie, before and after NUCCA, an upper occiput and atlas adjustment. Note: his left eye and left ear are higher in the first photo. This is Charlie before his upper cervical adjustment. HIs occiput was rotated up on the left side and his atlas was jammed up on the right side. His head was not on straight! Charlie after his adjustment. Now the nerves are flowing more freely. An upper cervical adjustment can help with problems further down the spine too. Tino is my little horse rescued from animal control. 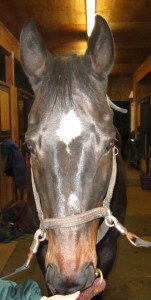 He had back pain and saddle-fit issues as well as other problems. If you or your horse has had back injuries, liberty horse training is a wonderful option to riding. Here is a video of chiropractic and massage. Note: the horse does not need to be held.